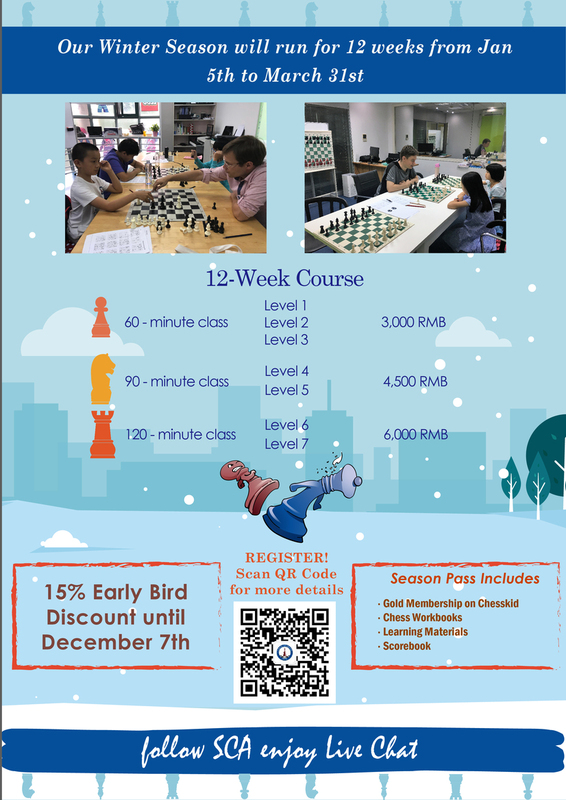 SCA Chess Academy provides professional international chess instruction in Shanghai. We teach chess in English at more than 15 international schools, and at centres, prestigious venues and homes all around the city. Our coaches are all professional foreign chess coaches and include chess masters and expert instructors. 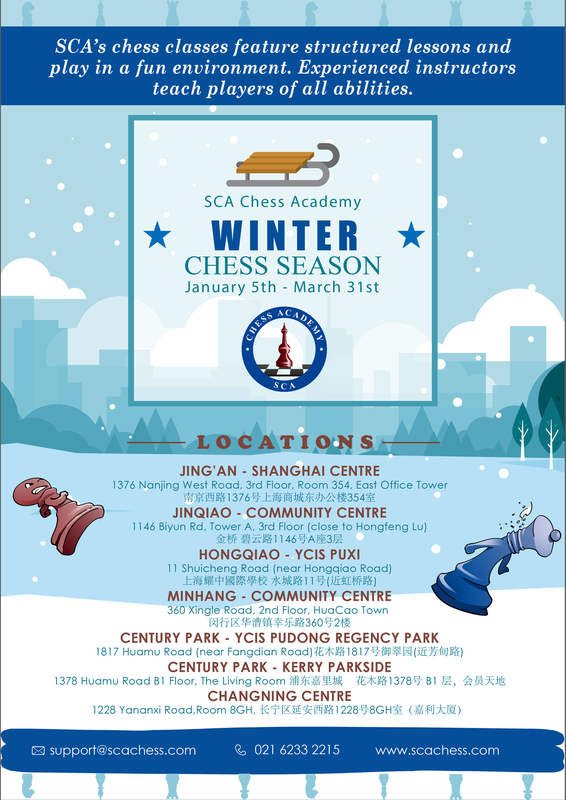 SCA's Winter Season opens on Saturday 5 January, with classes available at various times and locations across Shanghai. Register now to guarantee your place, maximum of 8 students per class. We teach in appropriate facilities with qualified coaches. However, we do not accept liability for accidents or injuries, and all guardians are understood to have agreed to this risk when registering for our classes or events. Parents/guardians are responsible for any damage caused by their children and for supervising their children before and after classes. We reserve the right to exclude children who have a negative impact on classes. Parents/guardians should bring students to the teaching location no earlier than 10 minutes before the class start time and collect them no later than 10 minutes after the class finish time. SCA cannot supervise students outside these times. Please respect the class start and finish times so we may provide the best possible experience to all students. Parents/guardians cannot stay in the classroom during the class. During the first class or free trial class, parents/guardians may stay in the class for the first 15 minutes only. Students cannot eat during the class. Our season pass provides access to one class per week at your chosen time for the duration of the season. At least 3 classes must be registered at one time to qualify for the Season Pass price. If only 1 or 2 classes remain they can be included in the next Season Pass when registered at the same time and will also qualify for the Early Bird Discount. Passes and classes are non-transferable. Where a class is missed, a make-up class can be taken at another time or venue subject to availability and providing notice at least 24 hours in advance. A maximum of 2 make-up classes can be taken in any one season. Make up classes must be taken within the same Season and cannot be carried over. However, make-ups for any classes cancelled by SCA can be taken at any time. Notice for sick leave must be given at least 1 hour before the class. Drop-in class tickets can be purchased at the individual class rate and used flexibly when there is space in the class. Registrations for each class should be made by at least 24 hours before the chosen class. Drop-in class registration cannot be approved if the class is full of fulltime course participants. We can only guarantee places for students who register for the entire course. Registration fees are fully refundable up to 5 working days before an activity commences. Less than 5 days before then 80% is refundable. After the first class and up to half way through the Season, 50% of the remaining classes registration fees are refundable. 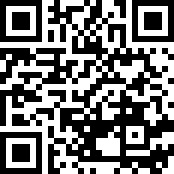 Any payment transaction fees will be deducted from the refund. After half of the classes in the Season Pass have completed no refund will be issued. 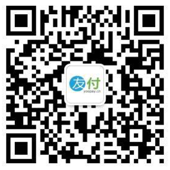 Students who attend two consecutive seasons from Autumn 2018 qualify for a discount of 500RMB from each 3rd season. Minimum attendance required of 5 classes per Small Group Class Season, and one Full Week of Camp during Summer Season. We may take photographs of participants and use for relevant promotional purposes. We may also publish competition participants name, age, school and chess federation on our Top Players rating list. If you do not wish you or your child to be included, please inform us.